On your plate: NASCAR’s top series’ season finale and Thanksgiving-weekend sports. 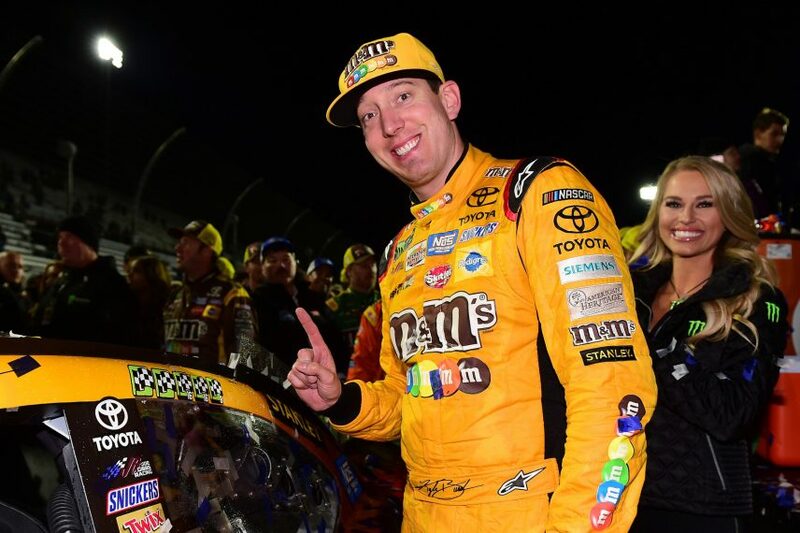 (November 19, 2:30/1:30c, NBC) Kyle Busch, winner of the 2015 Cup championship, is among the “Championship 4” who will duke it out on the 1.5-mile oval for the 2017 Monster Energy NASCAR Cup Series season championship at Homestead-Miami Speedway. The format is simple: The highest finisher takes home the title. Jimmie Johnson won last year’s Ford EcoBoost 400 and his seventh career Cup championship, tying him at the top with all-time greats Richard Petty and Dale Earnhardt. The season’s end will be bittersweet for NASCAR fans, as Dale Earnhardt Jr., the sport’s most popular driver, will retire from full-time racing. He’ll join NBC’s NASCAR broadcast team as an analyst next season. MARTINSVILLE, VA - OCTOBER 29: Kyle Busch, driver of the #18 M&M's Halloween Toyota, celebrates with the winner's decal in Victory Lane after winning the Monster Energy NASCAR Cup Series First Data 500 at Martinsville Speedway on October 29, 2017 in Martinsville, Virginia. Women’s college hoops highlights include defending national champion South Carolina at Maryland (November 13, 7/6c, ESPN2) and Maryland at UConn (November 19, 1:30/12:30c, ESPN). Some of the must-see games are Golden State at Boston (November 16, 8/7c, TNT), Oklahoma City at San Antonio (November 17, 8/7c, ESPN) and Golden State at Oklahoma City (November 22, 8/7c, ESPN). The 2017 ISU Grand Prix of Figure Skating Series season continues with the Internationaux de France (November 19, 10:30/9:30c, NBCSN) and Bridgestone Skate America (beginning November 25, 4/3c, NBC) in Lake Placid. (beginning November 23, 2:30/1:30c, ESPN) Sixteen of the top college basketball programs in the country (including Butler, UConn, Duke, Gonzaga, Michigan State and North Carolina) compete in the new PK80 tournament in Portland, Oregon, November 23–26. ESPN, ESPN2 and ESPNU share coverage. A long holiday brings lots of college ball, like Ole Miss at Mississippi State (November 23, 7:30/6:30c, ESPN), Baylor at TCU (November 24, noon/11am c, Fox Sports 1), Texas Tech at Texas (November 24, 8/7c, Fox) and Ohio State at Michigan (November 25, noon/11am c, Fox). On November 23, enjoy a Turkey Day feast of Minnesota at Detroit (12:30/11:30am c, Fox), the L.A. Chargers at Dallas (4:30/3:30c, CBS) and the New York Giants at Washington (8:30/7:30c, NBC). (November 24, 1/noon c, NBC) Sidney Crosby and the Pittsburgh Penguins are at Boston’s TD Garden for the Black Friday clash against Zdeno Chara and the Bruins. (November 26, 7:30am/6:30c, NBCSN) Formula One’s season comes to a close in the United Arab Emirates. Lewis Hamilton has already secured the drivers’ championship. (November 26, 6/5c, ESPN2) The Canadian Football League’s championship game, the 105th Grey Cup, goes down at TD Place Stadium in Ottawa.